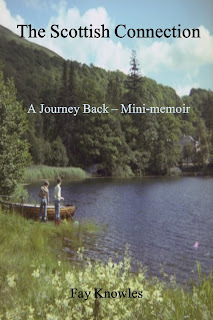 It is most heartening when a reader tells an author how much they enjoyed their book. And this goes for friends and family too! 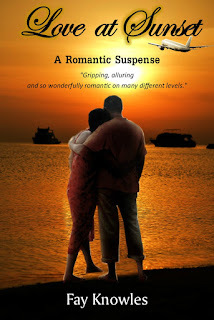 This morning a long time family friend, Bill Tizard, who bought a paperback copy of my romantic suspense novel “Love at Sunset”, told me that he loved it! Not only that, but he has read it twice and plans on reading it a third time after a brief break, so that it would all be new to him again! Bill said he loves the main characters Violet and Gordon and finds the plot really exciting. He also said he immersed himself in the settings and felt like he was actually going to Scotland himself and “enjoying the atmosphere”! Bill doesn’t have a computer and is not online, so I am happy that he can bury himself in a book and enjoy being whisked away to fascinating places and interesting people! Thank you, Bill! 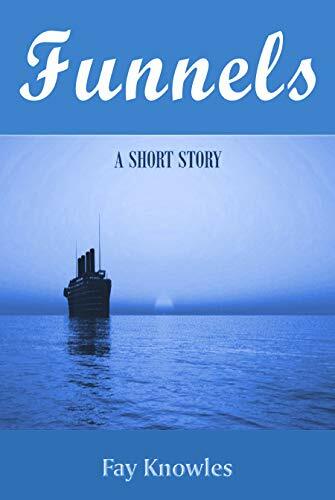 “Facing imminent danger and fierce opposition to love a second time around, Violet and Gordon seek a new life in Scotland, thousands of miles away from The Bahamas, but trouble soon catches up with them. 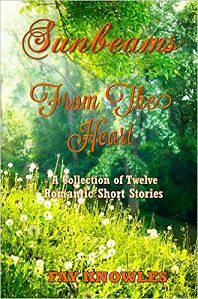 The couple finds themselves in and out of one adventure after another! 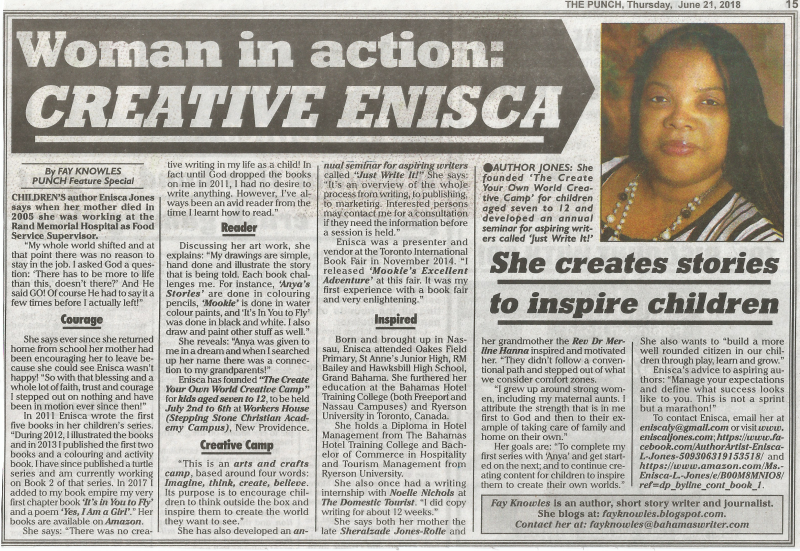 Here is my latest “Woman in Action” article that appears in “The Punch” on page 15 today about local children’s author Enisca Jones, who has founded “The Create Your Own World Creative Camp” for children. 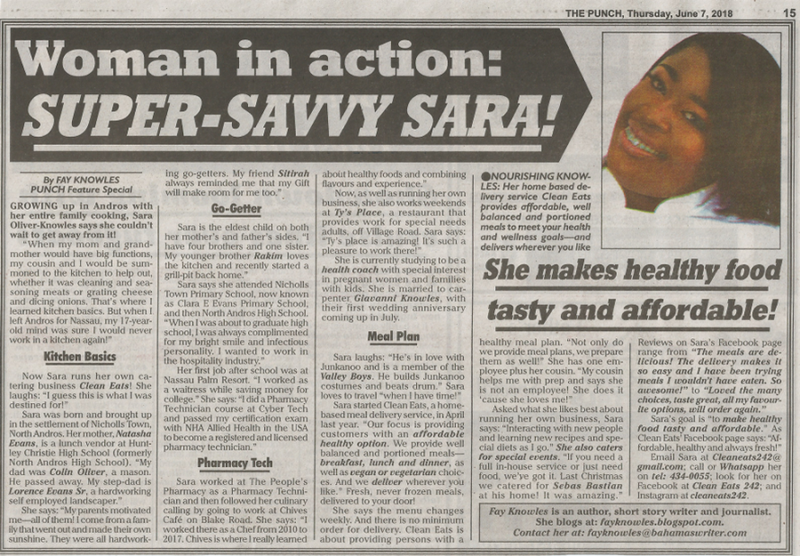 The Punch features an outstanding local woman in their “Woman in Action” column every Thursday, with my articles usually appearing every other Thursday. 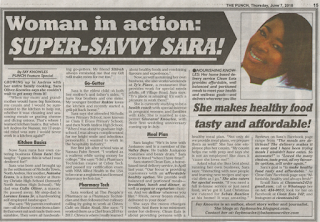 Here is my latest “Woman in Action” article that appears in “The Punch” on page 15 today about Sara Oliver-Knowles, whose home based delivery service CLEAN EATS (Facebook: Clean Eats 242) provides customers with affordable, well balanced and portioned meals. I love writing about these awesome ladies! We have so many enterprising and inspirational women in this little country of ours. 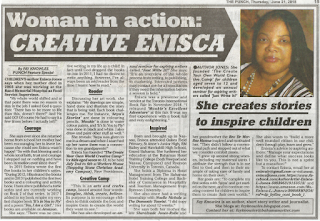 BAHAMIAN AUTHOR TANYA R. TAYLOR RIDING HIGH WITH STEPHEN KING! The amazing bestselling author Tanya R. Taylor has done it again! 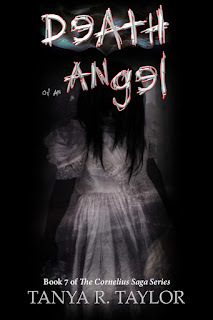 Her latest release “Death of an Angel” (The Cornelius Saga Book 7) is on Amazon’s Bestseller List today with Stephen King and Anne Rice! This is a moving tale of a family’s love and support for each other while evil forces work against them. 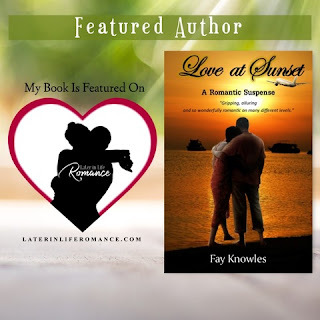 NEW COVER REVEAL FOR ROMANTIC SUSPENSE NOVEL LOVE AT SUNSET! 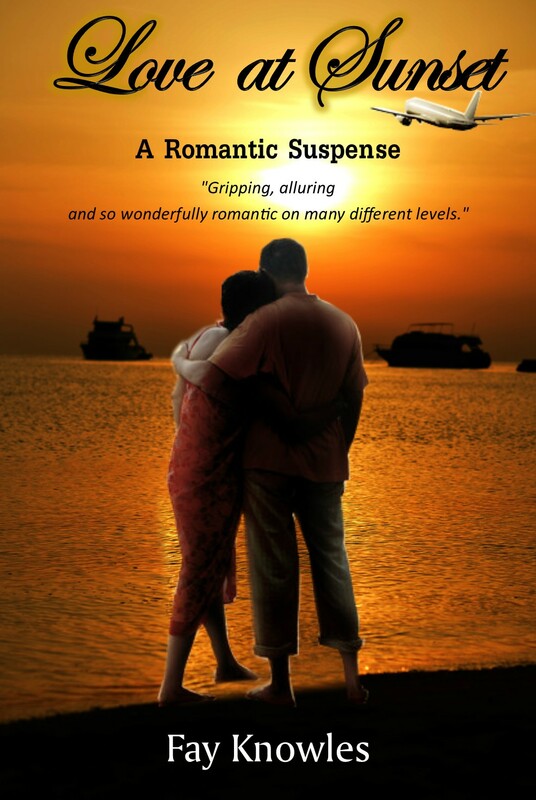 I am delighted to reveal the exciting new cover for my romantic suspense novel “Love at Sunset”. 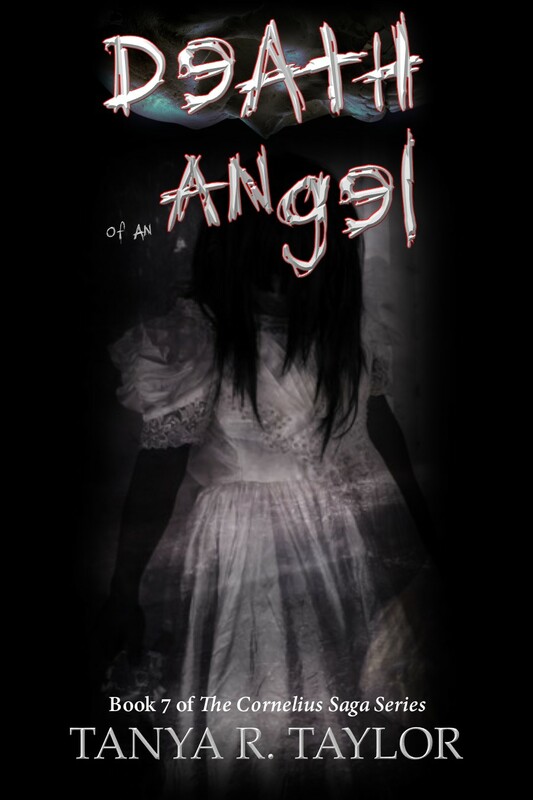 Many thanks to my good friend, bestselling author Tanya R. Taylor for the cover design. Tanya also designed the original cover, which was lovely, but we decided we needed to portray the main protagonists Violet and Gordon more as the go-getters and jet-setters that they are! While writing, I thought I would give you a heads up about my upcoming writer’s guide! It should be published in the next month or two. I will post here when it’s available. This writer’s guide is especially geared towards those who have always wanted to be a successful writer, but seasoned writers might find it of help too. I’m hoping that it will give those of you who love to write not only a little bit more knowledge, but also some inspiration!